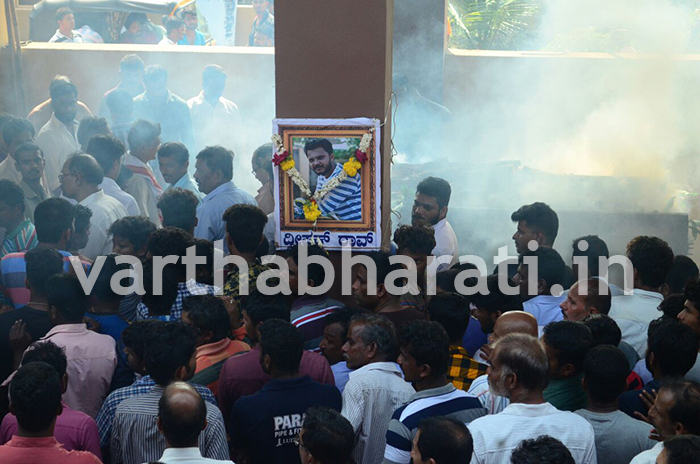 Mangaluru : The last rites of Deepak Rao who was brutally murdered at Katipalla on January 3, Wednesday were held at the Hindu crematorium at Katipalla Janatha Colony on the afternoon of January 4, Thursday. Earlier, there was much confusion outside Deepak's house since morning after the police had secretly shifted his body from the AJ Hospital to Katipalla, in the backdrop of the insistence of Hindu outfits to take out a funeral procession from the Hospital to Katipalla. The activists refused to allow the body to be taken to his house from the ambulance. It was after the intervention of Deputy Commissioner Sasikanth Senthil that the activists relented. The DC also permitted the funeral procession to be taken out from Deepak's residence at Katipalla to the Hindu crematorium. The funeral procession was thus taken out amid unprecedented security arrangements and reached Katipalla crematorium at 1.45 pm after traversing a distance of six kms. The final rites were held in accordance to the Kshatriya tradition. Deepak Rao (22), a resident of Katipalla Kaikamba who worked as an executive for a private mobile company and who was reportedly associated with a Sangh Parivar organisation was brutally hacked to death at the Krishnapura-Katipalla road on Wednesday by a gang of four assailants who waylaid his bike. The assailants were reportedly following Deepak . Though a critically injured Deepak was immediately rushed to the hospital, he had breathed his last by then. The Police who swung into operation immediately had chased the car of the miscreants and had zeroed in on them at Mijar where the cops had to even open fire injuring one of the assailants. All the four were later arrested.